Bill Landis had as much to do as anyone with the 10-year-old phenomenon of free, quality music in town, particularly on Ingersoll. Uber drivers and couch surfers have told me that the street’s music has become a tourist attraction for young people. We asked Landis to lunch to talk about the trend and about bartending in general. He chose The Walnut, a superb café in the Western Gateway that evolved from The Spot, Des Moines’ first modern food truck. The Walnut is an excellent repurposing of an historic brick building that housed The Walnut Tire and Battery store in its heyday. Brick, wood, polished concrete and industrial strength furniture provide ambiance fitting for an old industrial area. The café has superb light, an outdoor patio and lots of TVs. A long bar offers top- and middle-shelf drinks. The menu reminds one of The Spot. These burgers rank with B&B Grocery, Meat and Deli as the best in town. Soups are superb, salads quite good. Vegan bowls and pesto pasta, sliders, turkey melts, and chicken sandwiches are some other popular options. There is a happy hour (3-6 p.m.) Monday through Saturday. The Walnut’s website has a great map of parking in downtown, with meter prices. Since these range from $.25 to $1.25 an hour, it’s helpful. I asked Landis why he chose The Walnut. “The owner’s parents lived across the street from us when I was growing up. I really like the food and the people,” he said. How did this trend of good musicians playing for tips get started at the Greenwood Lounge? “It will be 10 years old in July. I didn’t have much to do with it. Scott Long told me that if I cleared out a ledge and a big screen TV, he would bring in a band and play for tips. He recruited Scot Sutherland, Greg Sutherland and a drummer named John. Scot and Greg are in the Blues Hall of Fame. Scot is up for Blues Bass Player of the Year — that’s nationally, not just Iowa. He plays all over the world now. We probably had music once a week and slowly built to six, or even seven, days a week. “Our second musician was Scott Eggleston (Soul Searchers). He played the Greenwood’s 75th anniversary show. We cleared a place in the back parking lot for that. More and more musicians became willing to play for tips. Some musicians won’t play for tips. That’s perfectly OK. The list of the ones who will, though, is certainly impressive,” Landis said. The fact that so many are willing to play for tips obviously says something positive about The Greenwood’s customers. And that all musicians have a little busker in them. “Yes, for sure. They are a good crowd. They come to enjoy good music and tip generously. Mike Wedeking (owner of Flying Mango and host of a music radio show on KFMG) and Hunter Wilson (partner in The Walnut) even bring food in to the shows to feed people for free. It’s a service industry trait. Lots of guys come in after working at a restaurant,” Landis explained. Does the crowd change with the bands? “It’s interesting how different bands have different followings. There are a lot of people who only come in on Thursdays because that is when The Soul Searchers play. Heath Allen has his own group of fans. So do David Zollo, James Biehn and Ducharmes-Jones. Jeff Banks has fans come in from Newton, his hometown. Stark Raving Madge and Joey Libido (both led by Steve Berry) have huge followings. Some bands are composed of musicians playing with each other for the first time. Anything that Scot Sutherland is involved with draws a big crowd,” Landis said. Sutherland books the Monday night shows. They are as popular as many weekend shows. “Yes. We moved the starting time up to 7 p.m. on Mondays. That appealed to a lot of people, an older crowd that doesn’t want to be out till 11 or midnight. It’s doing so well that some other musicians are experimenting with earlier starting times,” he said. I had heard that seven different places on Ingersoll now offer occasions with free music. Who was the most unlikely band to play at the Greenwood? “For sure it was a band from Bulgaria, or Romania, one of those Eastern European countries. They were in town, and the scheduled band let them take over the stage. I remember those guys really liked American beer — Budweiser, Coors and Miller, not the craft beers. We don’t hear that much from Europeans,” Landis said. I told him that Budweiser is now the best selling beer in England. “That just can’t be right,” he said. Do the crowds or the bands ever over indulge? “It’s a pretty well-behaved crowd. The biggest problem is probably people who want to dance too close to the band. I remember a couple band members who had to lean against the well to stay upright,” he laughed. Landis has close family ties in Ohio. How did he land in Des Moines? “My dad and his best friend came out to Lamoni to play football for their old high school coach at Graceland. As Dad explained it, they got off the bus, looked around at Lamoni and tried to get back on the bus, but the driver closed the door. He met Mom there and finished school at Drake. Graceland was only a two-year college at the time,” he recalled. Landis says bartending was not a calling. “I was home from college in 1979, and the bartender said, ‘Hey, you pour beer. Want to work?’ That was before the Greenwood had a liquor license. That came when Al Gladson bought it. He was a former cop and knew how to get that done. 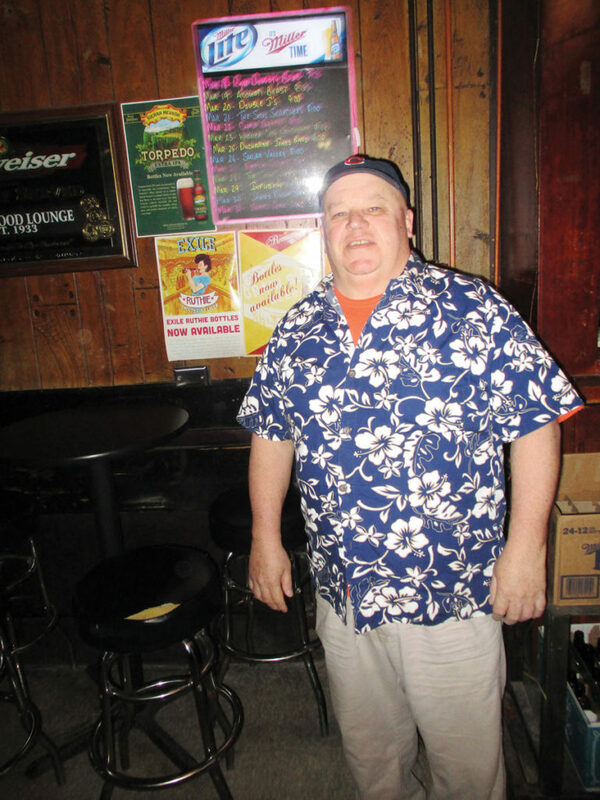 He also was the first owner here to hire women bartenders,” Landis recalled. What has changed the bar culturally? Having also taught elementary school, Landis sees only one major difference between students and drunks. Excellent interview with an excellent gentleman. As a former college housemate, I can attest to Bill’s mixological skills and musical acumen. How do the musicians make a living? Free is never free. Tips is not enough to live in. It sounds like a nice fantasy for the restaurant owners, but I can’t imagine raising kids and living in a decent home while offering your talent for free. Imagine asking the beer distributor to give beer for tips? Or telling the Uber drivers they will only get tips now? Wat if he only got paid tips when he was a cop? Musicians offer real services and should get paid real money for their service. They have invested years in their craft and thousands of dollars on their instruments. Treat them like the professionals they are!